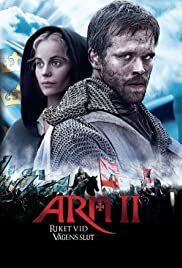 It's 1187 and the time has come for Arn and his beloved Cecilia to reunite. They have their son who has grownup without his parents and they have their promises of everlasting love. Now our hero only has to go home and make a future for himself, his family and his people. The story is told with elements of love, war, friendship and deceit and visually impressive surroundings between the barren desert landscape in the south and the lush verdure on the north. This is where great battles and expensive special effects take place. Yet, it still doesn't become more than simple manners. No conflicts are deep enough to make it interesting, no characters are shaped enough to touch you and no surprising camera work is seen at all. Sofia Helin, Gustav Skarsgård and all the others can't do anything about the high-flown and ridiculous dialogue that makes you wonder why they wasted all that money on the casting. 27 of 72 people found this review helpful. Was this review helpful to you?